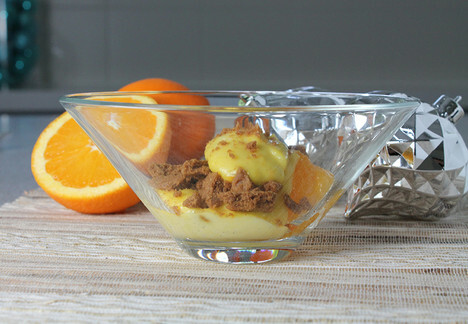 A warm boozy custard paired with seasonal spiced cookies and mandarin oranges. Fill a medium pot with 2 inches of water and bring to a boil. In a medium glass bowl, whisk together moscato, egg yolks, sugar, orange zest and cream. Reduce boiling water to a simmer and place bowl on top. Whisk continuously until mixture thickens, about 10 minutes. Place mandarin oranges in the bottom of six serving glasses. Pour warm zabaglione over oranges and top with crushed cookies.